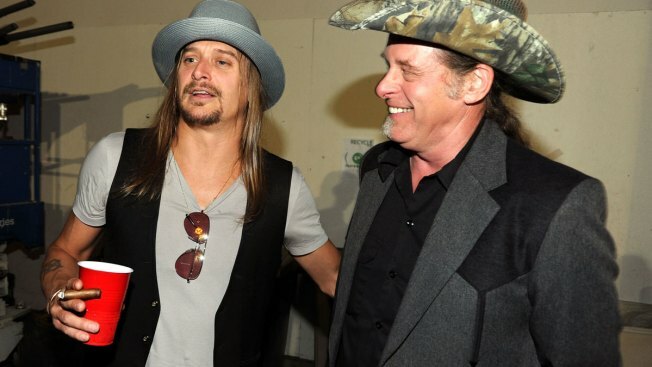 File Photo—Musicians Kid Rock and Ted Nugent attend the 2009 CMT Music Awards at the Sommet Center on June 16, 2009 in Nashville, Tennessee. Rockers Ted Nugent and Kid Rock joined former reality show star and one-time Republican vice presidential nominee Sarah Palin for dinner at the White House with President Donald Trump Wednesday night, an administration official told NBC News. Palin, a former Alaska governor, posted photos on Facebook of her, Nugent and Rock in the oval office, speaking with the president and his son-in-law and adviser Jared Kushner. "A great night at the White House. Thank you to President Trump for the invite!" Palin wrote in a caption that accompanies the photos. Palin and Rock were early supporters of Trump during the 2016 presidential campaign. Nugent, who has sparked controversies with his outlandish political comments in recent years, also supported the future president during the campaign. Known as the "Motor City Madman," Nugent called for President Barack Obama and then Secretary of State Hillary Clinton to be “tried for treason and hung” after an American ambassador and others were killed in an attack on the U.S. consulate in Benghazi, Libya, in 2012. He was also recorded calling President Obama a “subhuman mongrel” and a “gangster” in 2014.